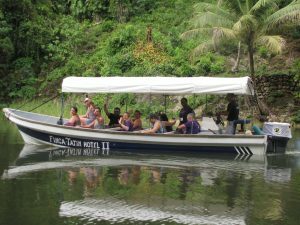 Our travel to the Baltimore clinic was by boat from the Finca Tatin hotel. At first, we weren’t sure we were going to be able to make the clinic day as it had rained so hard the night before. However, word was that the ocean had calmed down and there were no safety concerns about travel to the village after all. This village was off the Caribbean coast, and one of the more resource wealthy villages that we visited. I was surprised that this remote feeling village still existed as it does being so much closer to “city”life in Livingston and Barrio in comparison the more rural villages we had already visited in the mountains. There was a group of men and children waiting for us on the shore. Kids were laughing, playing in the water. We walked past a tarp covered in sardines as we trudged through the sand and grass to arrive at the clinic. This clinic was also larger and more spread out, which made patient flow a little easier. I was excited that this day was our windshield survey as I wanted to get a better view of the village and how its people lived. I was surprised to learn that school had been cancelled today because the teacher decided not to show up from Livingston. What a bummer for those kids, having a teacher that didn’t seem invested in her job. I wondered what kind of motivator might work to keep teachers coming back? I also was pleasantly surprised at the village tienda, which sold snacks as well as many common personal products. There was even a refrigerator/freezer in the tienda! (although it was not plugged in). The homes even had fences, some had gardens, a water source, and the animals that co-habitated (dogs, chickens, pigs, turkeys) all seemed a little more plump compared to the mountain villages. Our leader that took us on the tour, Manuel, was obviously a known community leader as several groups of kids came over throughout our walk into town to give Manuel a hug. Overall, the patients we saw on this day were more overwheigt and seemed to have more problems with diabetes and hypertension compared to our other clinics. I am certain that being less than a 20 minute boat ride to a larger city with resources (Livingston) made a difference in both patient activity level and proximity to processed food and other non-healthy resources. I was sad when we drove away in our boat, as we watched the children giggling and waving at us in their canoes close to the shore. This was our last clinic day for the trip. What a beautiful spot to call it a wrap. We only stayed in Guatemala city for a day before we left to head East in our giant old school bus to reach villages in the jungles of Izabal. The 8 hour ride was intense. It was hot, sweaty, and literally kept me on the edge of my seat. The gravel roads and steep cliffs mixed with sporadic drivers had me clenching the seat in front of me. As we traveled deeper into the country, the attire of people began to change. Instead of generic t-shirts and pants, I noticed the women dressed in colorful skirts and lacey tops layered over satin tank tops. We stopped at a diner and I got a hamburger. As I took my first bite, I thought about seeing the ribs on the cows as we passed them on the side of the road. When the animals are not being fed enough, it is clear the people are also struggling to get enough food. The burger tasted dry and gamey. I could only tolerate one bite before I passed it on to the others at my table. I felt guilty not finishing my food. Moving forward, I decided to eliminate beef from my diet for the trip. Then we went to a special place full of Mayan ruins, where we were in awe of the beautiful stelea –the natural rocks that were upgraded to carve the inscription of hieroglyphic texts and images of rulers. These were dated as far back as the 200 A.D. years. While we were taking pictures of the plaza juego de pelota, we saw clouds congregating above us and a roar of thunder in the distance. Before we knew it, we were welcoming the giant, warm drops of rain as we ran squealing with excitement and delight under the large palm leaves above us. The moisture from the sky was so refreshing after sitting on the sticky and hot bus all day. By the time we arrived to our final destination –Palaiso –we all happily went to our cabins with fans and cool a/c for our first sleep in the rainforest of Guatemala. Our adventure to the other side of the country had been a success. August 2018, Blog by Lauren Smith. On this day, we had our first taste of the rural village Esperanza in Guatemala. The bus ride was hot and sweaty, with some staggering and beautiful views of the rainforest. 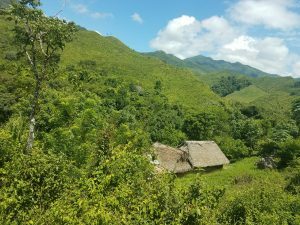 There were huts dispersed throughout the area that were the homes to people of this village. 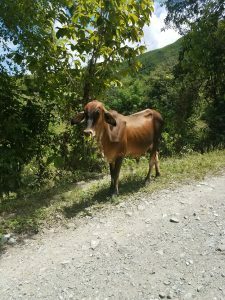 As the bus jolted up and down over large rocks and bumps, I looked out the window and was taken aback by the green, luscious leaves and stocks of corn that engrossed the hillsides. What a beautiful, rugged place to call home. 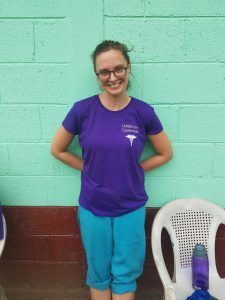 When our bus pulled up to the area we used as our clinic, there were Guatemalan women and children swarmed around the cement building, waiting for our arrival. Our first clinic day, I was assigned to be a runner. I helped make flags for the different stations to help us have some sort of organization within the chaos of the pop-up clinic. However, the disorder that occurred as a result of being in a single, hot room seemed inevitable. I ended up helping out in triage and the pharmacy the most. I enjoyed having multiple job roles since I am used to be a float nurse at work. I love variety in my job. The majority of the people we saw were women who were either pregnant, breast feeding, or almost pregnant. Many of the women and most of the children had a skin rash that they complained to be itchy and painful. I have never seen so many cases of scabies! I was relieved to learn that premetherine, which I had treated all of my clothes with, is also the treatment for scabies, as I was in such close contact with so many of the infected patients. This is also the first time I saw the way women carry their babies in a sheet over their shoulder and on their backs. I can’t imagine the dirty looks a woman would get in the United States if she carried her child this way. The other thing I noticed was all the gold caps and gold fillings that some of the native Guatemalans had, and the decayed and rotted appearing teeth that most of the others had. It was sad to see so many kids with decaying baby teeth. Overall, the day was exhausting but rewarding. This was one of the first times I have seen how happy people can be living such a simple life in poverty –and it seems they are so happy because they don’t seem to have been exposed to other ways of living. I felt a twinge of guilt and shame knowing how privileged I was and how terrible we are to each other and to people with less in the US. On the other hand, I was in awe of how a simple life of having less can lead to such genuine happiness. Another successful learning day in the books for me.